Retail businesses have the never-ending challenge of getting customers through their doors. This escalating demand has become more significant in the digital age as traditional methods such as yellow pages, direct mail and newspaper advertising have continued to decline in both popularity and effectiveness. As consumers continue to make more purchase decisions online, local B2C marketers must improve their digital marketing footprint and effectiveness in order to survive and thrive. Lack of Budget – 57% of retailers list lack of budget as one of their biggest challenges to using digital advertising campaigns. Not Priority – 54% noted that digital marketing is not a top priority for them at this time. Executive Support – 35% say lack of top executive support is one of their biggest digital marketing challenges. Lack Proper Roles – 34% expressed that they do not have the proper roles to make digital marketing happen. Retailers can no longer afford to be stagnant. The risks associated with ignoring or lagging in digital marketing as a primary driver to increasing foot traffic are substantial. In fact, avoiding new territory represents a far greater risk to retailers growth and sustainability. Priority – Retail marketers need to take the most important step of deciding that wading into digital marketing and making it a priority is job one. Without making this decision, it will be impossible to accomplish what is necessary to make online marketing effective. As a priority, brands have a shift in mindset that enables digital marketing to become their norm and thereby removing the fear and challenges associated with it. Reallocation – Once digital marketing becomes a priority within any small business, the top three challenges we described earlier diminish significantly. You have heard the phrase “the squeaky wheel gets the grease” and that is exactly what will happen. Your digital marketing priority will now enable you to make financial and resource allocation adjustments based on this new priority. By reallocating current marketing and other business budgets that are inline with your new priority, you will quickly realize you have resources available to execute with. Reallocation of budgets, staffing and resources may not be an easy exercise for some, however it is a must. Take the necessary time to review all expenses that are not inline with your priority and list them in a spreadsheet or on paper. Calculate all of the reallocated funds that will be instead committed to digital marketing efforts before trying to establish where to spend them. Strategy – Once you have created a new budget of financial and human resources that will now be focused on digital marketing, you will need to create a strategy. A digital marketing strategy combines targeting, tactics, platforms and methods that will be used in your campaigns. Typically an effective strategy will first involve considerable research, data and information gathering that provides crucial insights on your customers, their online habits and other key metrics. Get Help – Does all this sound complicated? Make no mistake about it, it is. Digital marketing combines numerous platforms such as search, paid ads, social media, mobile, content and email marketing just to name a few. Each of these specific segments of online marketing have copious requirements, nuances and details that require significant knowledge and experience to execute properly. In fact most local retailers do need help to bring everything together and that’s ok. Working with an experienced digital agency often makes the difference between results and frustration. Despite the decade-long suggestion that the demise of brick and mortar businesses is imminent, the fact is that consumers are still doing 90% of retail purchases in-store (Altimeter Group). Yes the internet and eCommerce have dramatically impacted the way consumers do most of their product discovery however, walking into stores to make their final purchases has and will continue to be the most crucial touch point for retailers. So as traditional print declines, marketers need to do a better job at aligning their messaging, distribution points and methodology with today’s consumer shopping patterns. 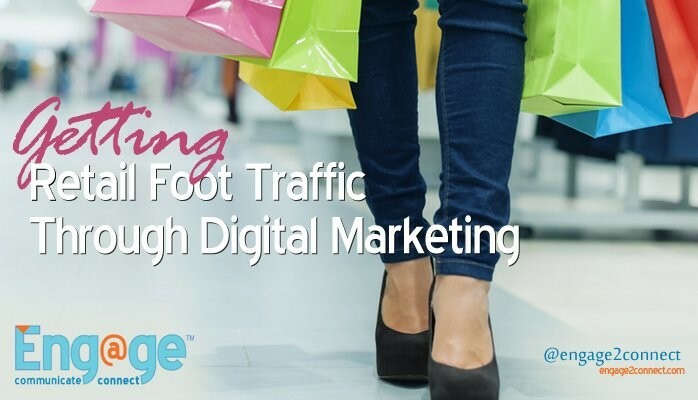 Getting retail foot traffic using digital marketing is never a one size fits all approach. Multiple digital marketing components and platforms must work together. Additionally all of your online messaging and marketing efforts need to seamlessly integrate with your customers in-store experience, creating moments that are memorable, consistent and effective. What Is Integrated Marketing For Small Business?